Leaf and Petal about to brave the world. I have been filming hummingbirds up close for several years and spend many hours finding and filming hummingbirds in the woods. This photo is of Leaf and Petal on the day they fledged. Leaf has his wing around Petal and seems to be comforting her. 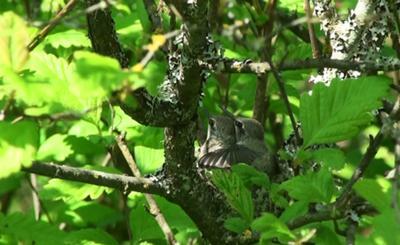 They both fledged successfully and now live in the woods where I film. I see them both often.